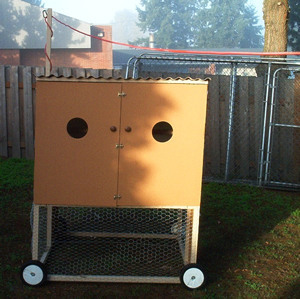 Home/How to make a chicken coop/The Coolest Features of A Mad Scientist’s Chicken House! One of the most interesting chicken houses I ever saw was a mobile, double decker with a small run on the bottom floor, and an enclosed house on the top floor. Despite it's small size it was kind of like an exotic recipe of ingredients, with so many wonderful features that you absolutely need to hear every one to see if you want to include them in your own chicken houses. So where do we begin? How about we start from the bottom up? The frame of this mobile coop sat on four wheels - one mounted to each of the four corners. Obviously, the fact that there were four corners, means the coop was built in a square or rectangle shape. The chicken house's frame sat just a little bit off the ground (like 1/2 inch or so). The inside roof height of the chicken run was a couple feet tall. There were a couple of access doors, and a wire skirt around the edge of the bottom floor run. The second floor of the chicken house included all the standard features of a good chicken house, like... roosts, nest boxes, a waterer, and a feeder. But it also looked like a mad scientist's top-secret lab, and included some Inspector Gadget type chicken features, like... mesh floor with removable droppings drawer, electrical power capabilities, a heater, and a timed light. The top floor exterior of the chicken house, while pretty standard, still had some features worth writing home about. There were handles for easily grabbing and moving the chicken house. The exterior also sported mesh covered air vent holes, locking access doors, and exterior door egg access. Finally, as if also designed by some space age inventor, there was a lightning-rod style post attached to the top, which anchored an electrical extension cord to the chicken house. The cord plugged in and powered the coop, and ran through the air over to an electrical plug on the outside of the chicken owner's home. While I think the electricity was awesome, I also want to make a cautionary comment... not everyone is going to be able to properly wire up an electrical outlet to a moving chicken house. So, if you do decide to build a coop with this feature, please proceed with caution. I think that goes without saying, but I have to make sure you are aware that there are risks involved, not the least of which could be death for you or your flock. The ability to power this chicken house, while still keeping it completely mobile, made this chicken house the most amazing compact chicken home I've ever seen. And I hope it inspires you stretch the boundaries of what you think are possible for your chickens, and reach out to do what seems impossible.